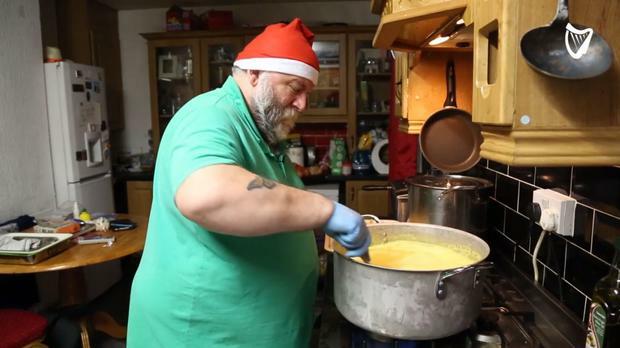 A Dublin man has spent his retirement helping to feed the homeless community in the capital. Each Monday, Brian Birkett prepares a curry dish, 4-in-1's, for those living on the streets. "I'm going to do fifty in number. I'll do ten 3-in-1's for the Halal people and forty 4-in-1's," Brian told Independent.ie. Brian began volunteering after noticing the numbers of homeless people increasing while out taking pictures of the architecture around Dublin. "I was taking photographs of the architecture of old Dublin and I found that I was obstructed from doing it because of the homeless sleeping in the doorways," he said. "So, I became very interested in the numbers of the homeless and I used to read about it on Facebook. "I started to get involved with the Monday night crew at the Central Bank, called 'A Lending Hand'." Independent.ie joined him on one of his nights volunteering as he donned a Santa hat to help spread some cheer over the Christmas period. "I started off bringing sandwiches and then decided to start up my own batches of curry for the homeless and it's worked out very well," he said.